Today I'm gonna have a ramble about this new bomber jacket I'm absolutely LOVING right now. My Mumma kindly picked it up for me when she was out recently as a little present. She snooped around Outfit and found this in Dorothy Perkins - which isn't a place I tend to shop in that often (for no other reason other than forgetting it exists!) The jacket is by Blue Vanilla and is only £18 online, bargain. It's the perfect transitional piece between Winter/Spring/Summer - it's a warm, thick material so it will keep you warm if there's a chilly breeze, but it's not a heavy jacket or coat that you'll end up carrying for the rest of the day if the sun shines. It's the perfect in between for the unpredictable Spring weather. It's on trend with the floral embroidery on the body of the jacket, which oddly enough ties they burgundy, grey and navy & white stripe together. They're not colours I'd typically put together but the embroidery somehow manages to make it all work. I've paired it with my blue high-waisted skinny jeans, a simple white tee, brown Chelsea boots, a brown belt and my usual black handbag. 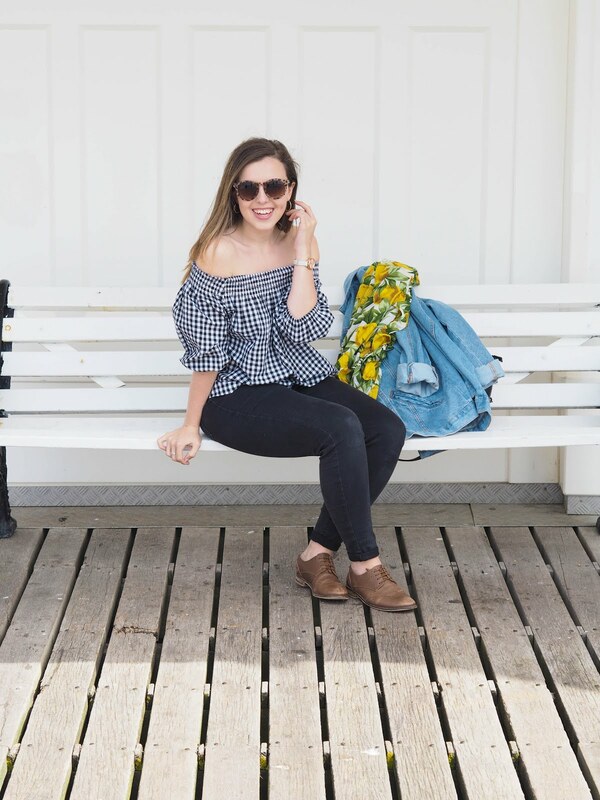 A very simple, casual look that I seem to be drawn to each time I open my wardrobe - perfect for Spring weekends. Reflective Aviators - Some where in Croatia...! What kind of jackets do you go for during Spring?